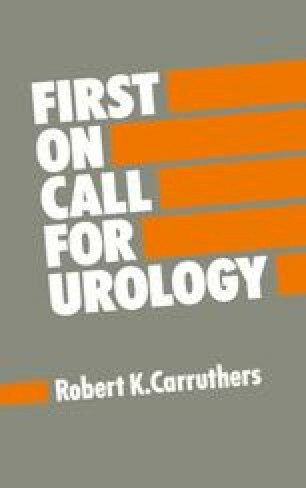 The urethra is an extremely sensitive structure and catheterisation is an uncomfortable procedure: therefore you should use plenty of local anaesthetic lubricant. The normal adult urethra usually measures approximately 28 Fr in calibre, although it is often narrower at the external meatus. Always use as small a catheter as will be effective, e.g. a 14 Fr or 16 Fr catheter for initial catheterisation. You must never use force—if difficulties arise, you must try a smaller-gauge catheter or perform a suprapubic catheterisation. There is never any justification for being overzealous. It takes only a second to damage a urethra, but to the patient this may mean a lifetime of micturition difficulties, repeated instrumentation and hospitalisation.